World City is a program at the Music Center (officially The Performing Arts Center of Los Angeles County, better known for Walt Disney Concert Hall and Ahmanson Theater) where they invite a performing arts group from around the world to put on a free show each month for family audiences. There were many loving parents enjoying quality family time with their kids at these shows. It was well-advertised and we were on the waiting list by the time we got there. When we were outside chatting with the staff, they told us that puppet shows are particularly popular because parents take their children to see these shows. I am glad to hear that, because good puppet shows are simply magical. They did two shows this time: one at 11:00am and one at 12:30pm. We were there to see the 12:30 one, so when we arrived, the 11:00am show was in progress. As we walked towards the theater, I got more and more excited because I could hear the music becoming louder and clearer. I was very happy to hear live music, because some of the theater troupes started using stereo systems to play recorded music to save money. But really, live music with traditional instruments is just so much more exciting. In Taiwan, before a show starts, the band will play their music really loud. This is a signal for all the kids to hurry up and get the best seat. You know, we were on the waiting list at the time and we weren’t even sure if we would actually get in, but I was thinking, even if I only got to listen to the music from outside, it was already worth the trip for me. We eventually got in (yay!) and saw the set-up. They sure brought everything. The puppeteers, the musicians, the puppets, the beautifully decorated puppet stage that’s hand-carved out of wood, everything. This was outdoors (hm, should’ve brought sunblock) in the amphitheatre where people sit on steps instead of individual seats, and there were many children too. No wonder that they had a hard time figuring out how many people would actually fit in the place. Chen Kuai Le (真快樂, literally, really happy) Puppetry Company is directed by Taiwan’s leading female puppeteer, Ms. Sih-mei Chiang (江賜美). 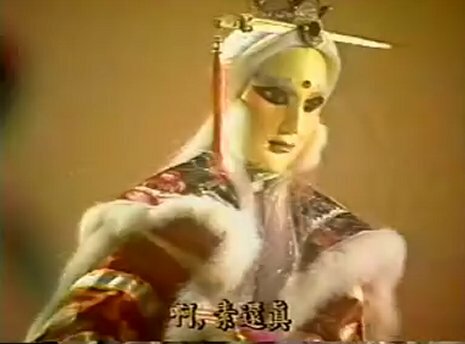 Her son Chia-tsai Ko (柯加財) and grandsons Shih-hong Ko (柯世宏) and Shih-hua Ko (柯世華) serve as puppeteers as well. 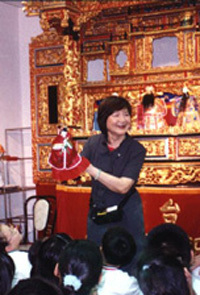 The company is one of the most famous traditional puppet troupe in Taiwan. 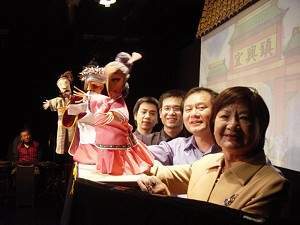 Shih-hong Ko and Shih-hua Ko also received The Most Popular Puppeteer Award in the Golden Dolphin International Puppet, Bulgaria in 2002 for the Carnival of Taiwanese Hand Puppetry. The program was broken up into two halves. The first part is Wu-Song, the Tiger Hero. It was about Wu-Song defeating a tiger that eats people. 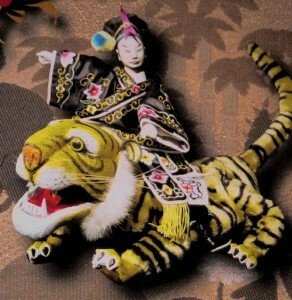 The second part is Carnival of Taiwanese Hand Puppetry. This portion shows the many intricate movements of the puppets. There were very few lines spoken. 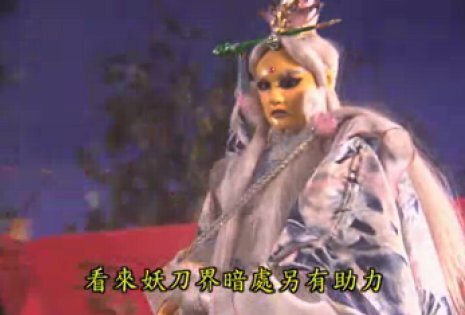 This is typical for a show that’s presented to people that don’t understand Taiwanese (the language these shows are traditionally in). When they are performed in settings where not everyone is expected to understand the dialect, such as in schools as a cultural program, or performed in other countries, the version with less talk and a whole lot more action is often presented. Otherwise, in a setting where everyone understands Taiwanese, the shows are usually performed in front of a temple during festivals and have stories based on folklores and classic literature (or just random things made up by the troupes). 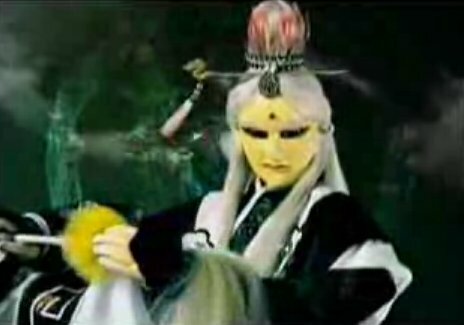 In the Wu-Song story, before Wu-Song went to fight the tiger, there were four brothers who also went to fight the tiger using different martial art skills (sword, knife, fists, etc.) and of course, they all failed before the hero arrived. And of course, this was just a convenient way to show off puppets fighting in different styles. And watching this kind of stuff growing up is why I love puppets doing martial arts so much, and even did my own version in Think, Outside the Box. In the Carnival of Taiwanese Hand Puppetry, a series of archetypal characters are presented. 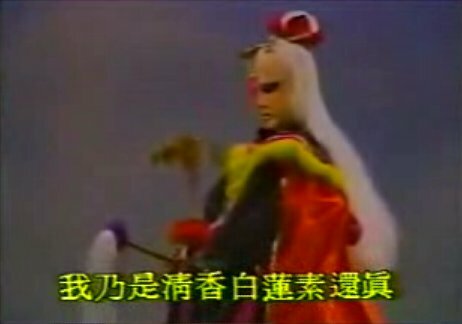 The ones presented this time (and most of the time) are the man, the woman, the old, and the clown (生、旦、末、丑). They often show the (intellectual) man reciting poetry, using a fan in one hand, and picking up a pen to write. Since I watched quite a few of these, I’ve seen those things done many times. However, I was impressed when the puppet lit a candle. That I did not see coming. The woman typically came out and played with her hair and such. The old man showed his special way of walking, because he’s old and slouching. He also lit a pipe and blew smoke. The clown came out and clowned around. These things are a little hard to describe unless you saw it with your own eyes, I guess. Oh yeah, and these things are usually done as seperate segments, but in this particular performance they came up with a simple story to have these four characters interact and have a conflict and resolution. It was clever. And then they also showed puppets spinning plates and handkerchieves. 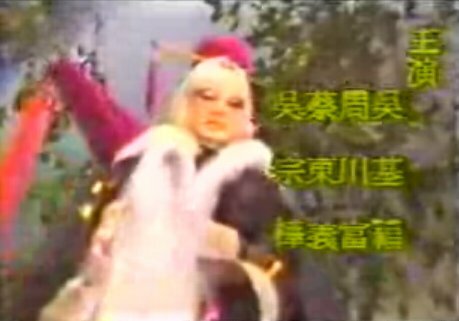 What I haven’t seen before were a man chopping down a tree, and a woman ribbon dancing. 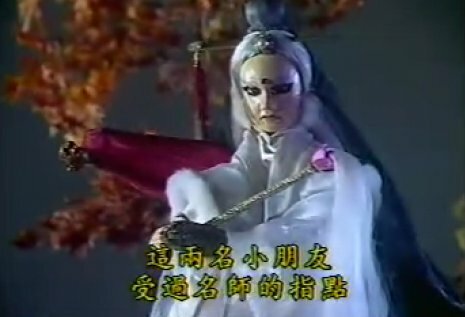 I’ve seen ribbon dancing done with Chinese rod puppets, but I haven’t seen them done with Taiwanese puppets. They are definitely very skillful and are pushing the envelope coming up with innovations too. Between the Wu-song story and the Carnival half, someone came in front of the stage and gave a little bit of an introduction of Taiwanese puppetry in English. It was short, and also they had a little bit of a workshop thing explaining the mechanisms of these puppets. Oh yeah, during the show I was also explaining / translating stuff for a Chinese friend sitting next to me, and a dad with his kid we just met while in line. Those information wasn’t entirely necessary, but hey, I’m there, might as well. I am talking about information like, a puppet come out one side of the stage, and then quickly swings by and exits another side of the stage, and then he proceeds to do this a few times… what does that mean? It means he is travelling a long distance in a hurry. Is that essential to know? No. But it’s a convention that you pick up when you watch it growing up. These shows don’t need to teach you everything about the art form. These shows are entertainment, and an exposure to another kind of art. If anyone is interested in the details and more background information, they can always look it up afterwards. Oh yeah, guess where you can get that info? Subscribe to this blog (wink, wink). 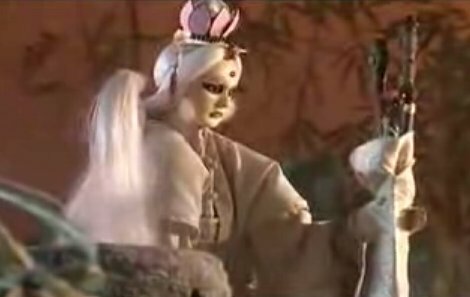 One of my major goal this year with this blog is to write more about Taiwanese puppetry, since I don’t really see a lot of information about it on the internet. 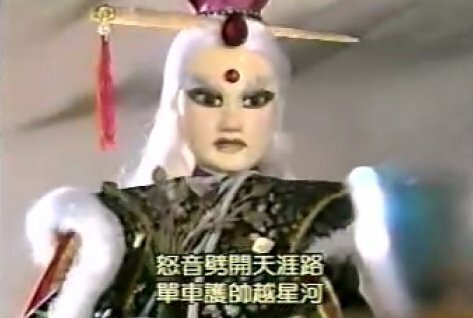 When I see introductions to Taiwanese puppetry on the internet in the English-speaking (uh, typing) world, it’s often just what they are… introductions. There are not enough details for people that actually want to know more about it. And I think that’s what I should be doing this year… writing more about this art. I want to share this video because it’s really really really well-done. 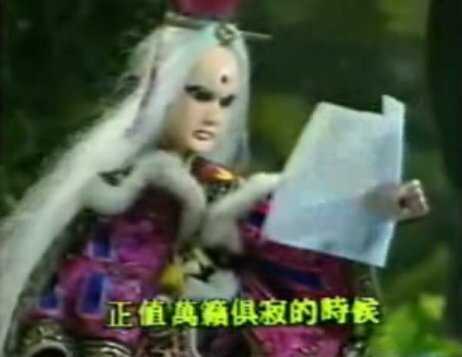 This was a puppet video released around two years ago inspired by the 2006 film Huo Yuan Jia (霍元甲) starring Jet Li. It was also released in North America under the title Jet Li’s Fearless in the UK and US. It was about Huo Yuan-Jia, a martial art master from the Ching Dynasty. (By the way, Chin Dynasty is a dynasty that really amuses me. Maybe we’ll talk about that later.) The background music is the theme music to the movie, written and sung by Jay Chou, one of the most well-known singer/song-writer in the world of asian pop music. The video is simply amazing in terms of puppeteering and editing. All the shots are meticulously planned out and the attention to details is superb. They must’ve spent a lot of time on this. The way the characters handled the instruments and weapons are very human-like, and it’s just one of those videos that I’d watch again and again to soak in all the details. 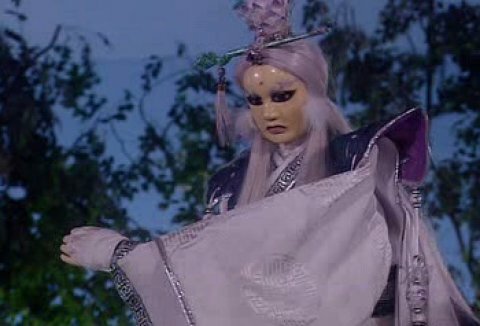 That said, although the puppeteering is very good, it cannot look that good without really heavy editing. I watch this kind of puppets growing up, and I know the mechanisms of these puppets. So, I know that they did really heavy editing with the left arm. Normally, the puppet’s left arm is controlled by a rod from below. The left arm rod is usually hidden from the audience by the character’s really wide sleeves, but it is not possible to hide the rod when the sleeves are so narrow like the main character’s. 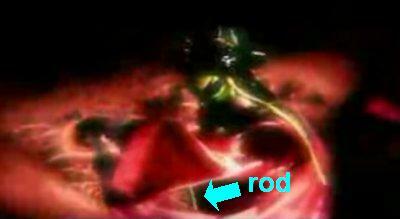 They are so careful with this stuff that this is the only frame in the whole video where I can show you the rod. This is from around time code 1:46. You can only see a really short section of the rod, and it just goes to show you what I said about the rod being normally covered by the sleeves. For the main character, since there’s not enough sleeve to cover up the rod, they must’ve really carefully edited it out. And since the character is constantly moving, it must have been a lot of work to edit out. Again, what they’ve done amazed me. Who made such a video? People had different guesses and the group of people that made it used a pseudo-name and didn’t released much official information about it. When it first became viral on the internet, there were a lot of discussions about who made this video. Some said it was made by Chinese people, and some said it was made by Taiwanese people. Some said it was made by professionals that work in the industry, and some said these were made by people that were just passionate about the art. But I think, you can buy puppets, but you are not likely to have access to a studio with set pieces that are to the scale of the puppets if you are not in the industry. And these people obviously have really good skills, and most likely a lot of experiences as well. I believe it’s done by professionals as a side project. Anyway, this really shows that with a vision, good skills, and a lot of time, you can make all kinds of crazy and amazing videos come true. 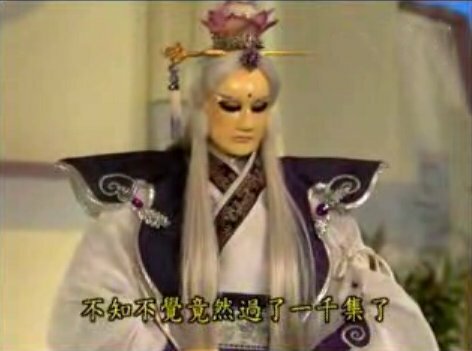 Today, April 30, 2008, is the 20th year anniversary of Su Huan-Jen’s (素還真) very first appearance on April 30, 1988. Wow, 20 years. I’ve been watching the same character for 20 years. That’s more than 1300 episodes and it’s still going. Today, let’s recount how the puppet has changed in the last 20 years. 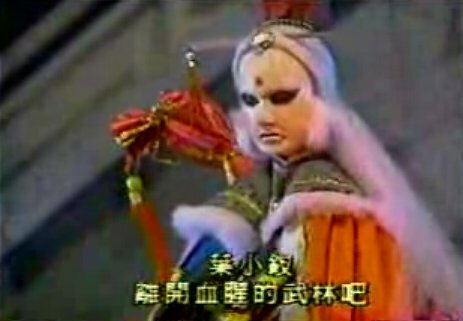 To give a little bit of background information: The most popular puppet series in Taiwan is Pili (霹靂). It’s one never-ending, good vs. evil, epic saga that has gone on for more than 20 years. Su Huan-Jen is the lead character of Pili. He is handsome, intelligent, eloquent, and calm. He is also a kung-fu master and full of wisdom. 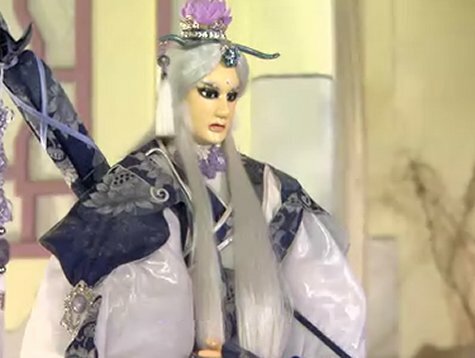 He is the leader of the good people and is constantly trying to resolve conflicts in the Wulin (martial arts world) and is always fighting against the evil ones. 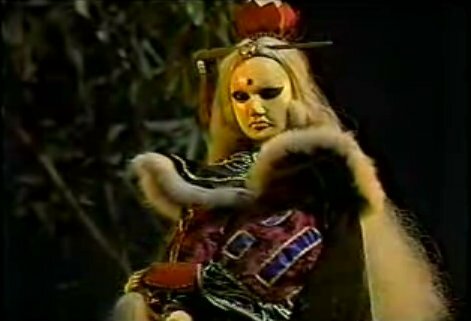 1988: Su Huan-Jen’s first appearance. He was actually introducing himself in this one. 1990: In this shot, he was reading a letter from his wife, who had to go into hiding without saying goodbye. She did that because she did not want to become a burden while he faced the enemies. It didn’t help. He spent a lot of time looking for her and had gotten into more danger because of it. Too bad. 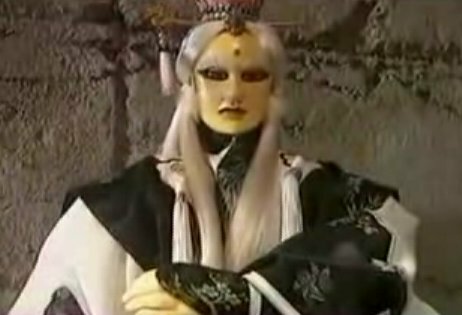 1993: In this shot, he was telling his best friend Ye Hsiao-Chai to retire from Wulin to be away from danger. Ye later came back to help Su anyway. He was still an active character in 2008. 1994: This particular puppet is a little odd. Normally these puppets have a neutral expression but this one seems to be smiling. Maybe that’s the reason that they didn’t use it for very long. But it was interesting to see. 1995: Not wearing his hat. 1995: This is around the time that Pili was experimenting with bigger puppet sizes. 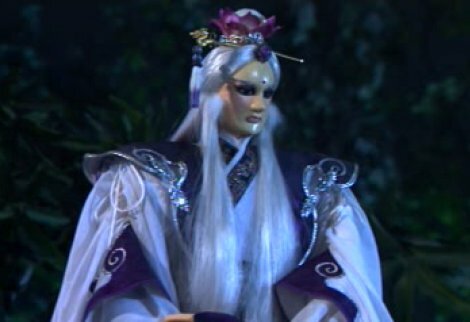 Around this time, all characters have really broad shoulder paddings because they were in the middle of figuring out how to hide the mechanism inside the puppets. 1997: Experimenting with wearing white. 1999: Still wearing white, but different style from the last two years. 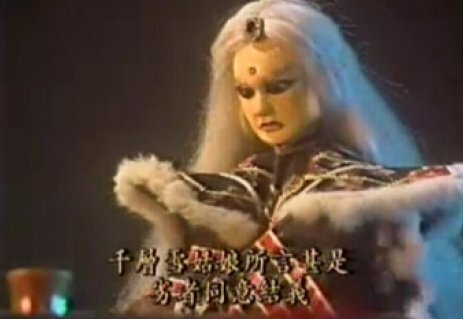 2000: This puppet is using a head that’s similar to the one from the movie Legend of the Sacred Stone that they were shooting at the time. I cannot put in words what exactly is different, but it’s more similar to the movie head instead of the regular TV heads. 2002: Back to wearing white. 2002: He was severely injured, hence in a wheel chair in this one. Behind the wheel chair was his son. See? I told you that he came back to life. 2002: He sure changed quite a few times in 2002. There was a reason but the plot was too complicated to explain. 2004: Breaking character and saying that he’s celebrating his 1000th-episode anniversary. 2004: Trying out purple. I like this one a lot. Maybe it’s because the color scheme matches the house (see the background). 2007-present: I actually didn’t like this face as much when I first saw it. It was meaner than the previous one, but the more I looked at it, the more I liked it. I guess it’s because it made him look more decisive and determined when he was faced with challenges. So, that’s 20 years of Su Huan-Jen. The puppets certainly changed many times. There were a few things that were his trademarks and pretty much didn’t change though. The puppet maker that carved out the first head and face decided to give him swirls in the eyebrows. And that became something that’s very recognizable him. The first stylist that worked on him decided to give him a hat shaped like a lotus flower. And he’s been wearing variations of that throughout the 20 years. Also, he normally carries a duster (拂塵). In traditional Chinese and Taiwanese drama, you often see characters carrying these things. Unless they are actually servants, these are usually elegent-looking dusters that serve as decorations. People carry these as symbols to remind themselves to rid their minds of dust to achieve clarity. Ah, 20 years. That’s pretty crazy. I’m certainly happy to have been born in Taiwan to have a chance to know about and witness this phenomenon. 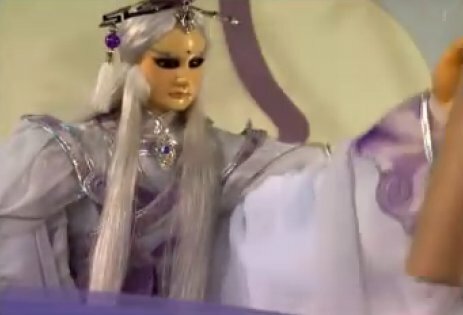 Following up the last post Smoke, Flames, Taiwanese Puppets Live!, here’s a video footage where the puppeteers came out from hiding behind set pieces and showed the crowd how they were operating the puppets. In the video, you get to see how big the TV puppets are in comparison to the puppeteers. You can see that each puppet is puppeteered by one puppeteer (what an awkward sentence). The legs are often covered up by clothing so the puppeteers usually only focus on the head, arms, and the body movement overall, except when the focus is on walking or kicking. A puppeteer would use his right hand to control the puppet’s head and right arm, and his left hand to control the puppet’s left arm. Due to this mechanism, the puppet’s left arm is a lot more flexible than the right arm in terms of movement. So you often see the weapons in the left hand, as demonstrated in this video.